Dozens of area designers|! 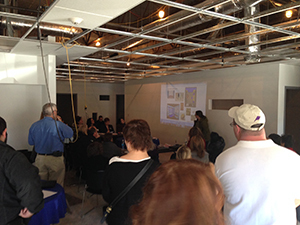 !| architects and construction teams recently visited the facility to walk through plans for the 12 rooms to be renovated as part of Building on Hope's $300|! !|000 community-funded renovation of Opportunity Networks in Amherst. Building on Hope, a community initiative of volunteers who collaborate with builders, architects, designers and suppliers to provide physical improvements to facilities associated with nonprofit service groups, is taking on its biggest project yet — a $300,000 renovation of Opportunity Networks’ facility in Amherst. Opportunity Networks is a nonprofit serving young adults and adults with acquired and development disabilities who live in the Souhegan Valley and greater Nashua area. To accomplish its goal, Building on Hope is seeking financial support from businesses and community members to complete the project over one week in May. Every two years, Building on Hope takes on a new challenge – organizing volunteers, collecting resources and focusing attention on a specific “extreme makeover” to be completed over the course of a week with volunteer labor and donated goods. In the past four years, Building on Hope has successfully completed over $500,000 in community-funded renovations for Easter Seals New Hampshire and Girls Inc. The Opportunity Networks project involves the organization’s 6,000 square feet of space at 11 Caldwell Drive in Amherst, which has been occupied by Opportunity Networks for more than 30 years. In that time, little more than basic updating and maintenance was performed. Opportunity Networks financed the first phase of construction, increasing the building’s usable space by 50 percent. Work included demolition of the interior, installation of new walls, a new roof, sprinkler system, rough electrical work and a new HVAC system. With the support of Building on Hope, local businesses, donors and volunteers will handle the finishing touches, transforming it into a state-of-the-art facility that will improve the lives of people with all disabilities. A total of 12 rooms will be renovated. Rooms vary by purpose, from promoting healthy and independent living skills, employment and learning, to pursuit of interests, and general needs. Volunteers will have the chance to aid the creation of a movement room, a tech theater, creative center, administrative offices, function and conference rooms, kitchen and cafeteria, among others. Renovation will allow for expanded hours to further support families, provide after school programming/high school transition services, multisensory learning, and communication technologies. There are several ways to support the effort, according to Building on Hope co-chair Jonathan Halle. Volunteers will mobilize and begin work in early May and a reveal and ribbon-cutting ceremony is scheduled for May 18. For more information and to make a donation visit: buildingonhope.org.